Whenever you go to Buy any Electronic Gadget — Phone, Tablet, Laptop, Watch — the most important specification isn’t its processor speed or its camera quality. It’s how long the device’s battery backup is. Imagine easy access to such batteries that provide more battery power after charging it once, do not give up in less time and have a life of many years. To achieve this, the researchers at Massachusetts Institute of Technology (MIT) and Samsung, have developed a new material that could potentially revolutionize the Battery industry. 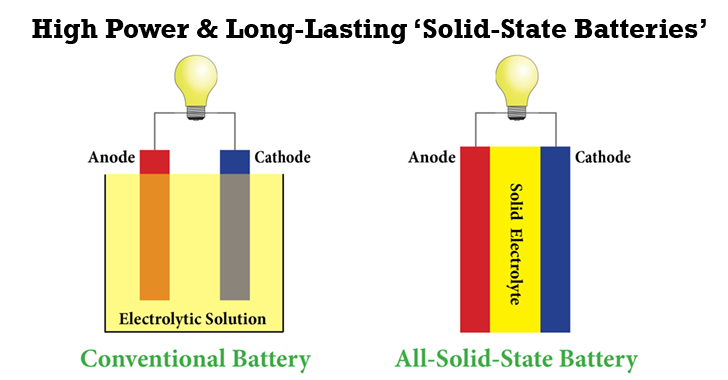 Researchers have solved all these Battery issues with just one weird practical approach, called Solid-State Electrolytes. Today the cells we depend on contain Liquid-State Electrolyte, the researchers thought of replacing the one with a Solid form of electrolyte. Solid-State Electrolytes could simultaneously address the greatest challenges associated with improving lithium-ion batteries (LIB), with the possibility to increase storage, battery life, and the safety of batteries. The development of materials for clean energy. Wanted the devices’ battery to last for an indefinite period. Importance of safety of batteries that are currently being faced by many of us. “The electrolyte in such batteries, typically a liquid organic solvent whose function is to transport charged particles from one of a battery’s two electrodes to the other during charging and discharging — has been responsible for the overheating and fires that, for example, resulted in a temporary grounding of all of Boeing’s 787 Dreamliner jets,” one of the researcher explains. But, the batteries based on Solid-State Electrolyte are also Safe, as liquid electrolytes are the main reason batteries catch on fire. "The initial findings focused on a class of materials known as superionic lithium-ion conductors, which are compounds of lithium, germanium, phosphorus, and sulfur, but the principles derived from this research could lead to even more effective materials" the team says. Be it a laptop, electric car, camera or a cell phone, Li-ion battery is found in every product as they give an advantage of recharging the same battery instead of replacement. To know more, visit the official MIT newsroom. In the past, many other researchers have attempted to find a solid replacement for the liquid electrolyte, but this group is the first to show that this can be done in a formulation that fully meets the needs of battery applications. The research will result in the making of a “Power Packed” battery. Moreover, with an objective of increasing the battery life, Apple also plans to build Fuel cell batteries that are capable of charging any Apple device for many days without a recharge.